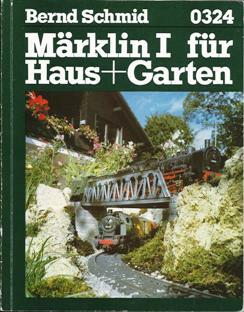 One significant addition to the Märklin I product line occurred with the publication of #0324, “Märklin I für Haus + Garten” (Märklin 1 for House and Garden) in 1983. This book would prove to be quite influential in the expansion of Gauge 1 interest in Europe. Written by the well-known model railroader Bernd Schmid, the 0324 indicated that Märklin was serious about their Gauge 1 product line. Schmid was well known already, having written several books for Märklin about their H0 line of trains. He also write their book about mini-club. Given editorial deadlines, this book must have been started in the late 1970’s, about the same time that the Märklin Gauge 1 product line began a significant expansion. Prior to that date, the Märklin Gauge 1 items had been limited, but by 1978, this Märklin line began a significant improvement. The 0324 book was part of that effort. 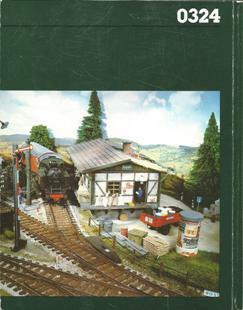 In this useful book are two examples of building a Gauge 1 model railroad. One, “Rossberg” was a 1 meter x 5 meter indoor model railroad. The other, “Altmühlhof” is an outdoor “garden railway”, measuring over 3 meters by 6 meters. Both show construction aspects of Märklin Gauge 1, and because of editorial lead times, construction of both railroads must have started in the 1970’s. The 0324 also shows the human side of model railroading. Other model railroad manufacturers had also shown people using their products, but the 0324 takes this notion to new heights. Many of the photographs in the 0324 book show real people involved with the Märklin Gauge 1 trains, right down to the family cat. And, LGB would later carry the concept even further, illustrating several of their customers and including their names. Most model railroad books are largely devoted to the model railroad itself, but little regard is given toward the humans that are building and enjoying the trains. This is not the case with Märklin 1 für Haus + Garten, a refreshing change. In part, much of the early promotion of Märklin 1 showed families being involved with the trains, and the 0324 is a reflection of that. On a personal note, I have found this book to be quite helpful, and the Rossberg design was a major influence in the design of my personal Gauge 1 railroad, Amstetten. But the 0324 goes beyond the mere how-to of building a model railroad, for it expands out to cover scratch building model railroad structures, making the trains look more realistic by weathering them and an entire chapter devoted to photographing those trains. The 0324 did not get much circulation in the North American market, presumably because of the language barrier that resulted from it being printed only in German. At the same time, the 0324 was part of the general promotion of Märklin I in the 1970’s, and the significant presence of people using the product was a departure for its time. Some of the ideas and tips are noted in the subpages to this page, but even if you don’t speak German and are interested in this subject, the 0324 is worth finding. It is not commonly seen, since it has been thirty years since its publication.